Sixteen years ago, who would’ve thought that the guy that played the dad in Malcolm in the Middle would go on to become one of the industry’s most beloved actors? Bryan Cranston, then known mainly for playing the goofy but lovable father Hal in the beloved sitcom and also for that one episode of The X-Files he was in, broke out majorly when he was cast as the lead in creator Vince Gilligan’s TV series Breaking Bad. Needless to say, it became quite the cult phenomenon and skyrocketed Cranston’s career into the stratosphere, landing him several roles in films like Argo, Godzilla, and even that Total Recall remake that happened but people don’t want to acknowledge happened. Even after the show’s final episode in 2013, Cranston has managed to solidify himself as one of Hollywood’s most popular performers, elevating anything he’s in just by his mere presence. His latest role in Trumbo is exactly that, a magnificently entertaining performance by Cranston that elevates the otherwise conventional biopic of legendary Hollywood screenwriter Dalton Trumbo. Along with several other screenwriters known as the Hollywood 10, Trumbo (Cranston) was a highly sought-after scribe of several motion pictures who also happened to be an open Communist, a major red flag in the anti-Soviet Cold War environment of the 1950s. He and his fellow writers, among them Louis C.K.’s composite character Arlen Hird, are called forth to testify in front of the House Un-American Activities Committee, but their refusal to answer questions not only lands them lengthy jail sentences for contempt of court, but also puts each one of them, including Trumbo, on the Hollywood blacklist. 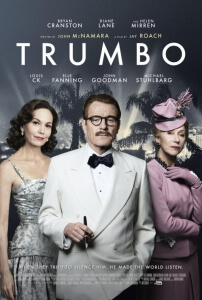 Trumbo, undeterred, resolves to continue writing through several pseudonyms and covert methods, and the rest of the film details how he manages to bring his family and friends in on his ambitious attempt to keep working despite the limitations. It kind of goes without saying, but Cranston is terrific here. He brings Dalton Trumbo to life though an electrifying portrayal of megalomania and mischief, a character that is certainly difficult and not even easy to like at times, but has a real charisma about him that has you on his side even when he’s clearly in the wrong about certain things like his Communist beliefs. He may not have necessarily been right, but it’s what he believed in and it made him happy, and who can deny someone like him the one thing that he profoundly believes in, especially when he’s this fun to watch? Cranston makes the part far more entertaining and larger than life thanks to his lively presence, which can convincingly switch at a moment’s notice when he’s challenged by authorities (an early confrontation with uber-patriot John Wayne is particularly cheer-worthy) or emotionally speaking his mind, such as in a late television interview where he denounces the treatment of blacklisted writers and even the Academy Awards he won under several guises (on a side-note, if they use that particular award-bashing snippet as Cranston’s Oscar clip, that would be amazing). The rest of the ensemble cast is quite good too, with Helen Mirren in particular having fun vamping it up as vicious gossip columnist Hedda Hooper, but Cranston reigns supreme in a truly wondrous performance. In fact, he may end up being the one thing about the movie that’s consistently great, while the rest of it ends up flip-flopping in quality. The biggest problem with the film is its tone; it doesn’t know if it wants to be a larger-than-life screwball farce, or a much more serious film about the treatment of individuals who were called forth to HUAC and dragged through the dirt as a result. Director Jay Roach, known for political fare like Game Change or Recount but also for straightforward comedies like Austin Powers and Meet the Parents, clearly wants to have half-and-half, but they don’t end up gelling together as well as they should, with certain turns – either true to life, or heavily dramatized for the sake of entertainment (and there are quite a few notable historical inaccuracies here, but it would take too long to go into them) – coming out of left-field to disrupt the current tone the film is trying its hardest to establish. Even Cranston looks a little confused when a cancer sub-plot arrives right out of nowhere, in the middle of a completely different scene. Roach does, however, have the common decency to make this a fairly handsome-looking movie, replicating the over-saturated style of 50s filmmaking almost identically with heavy lighting shining on actors’ faces and camera movements that make it feel like something made in that time period. It’s a nice little touch, and while the script does stick to biopic convention more often than not – lots of time jumps, heavily dramatic music, highly telegraphed breakthrough moments, and other clichés are all here, leading to the irony that the weakest part of a film about a screenwriter is the script – Trumbo at least looks very handsome while it’s doing them, once again thanks to Cranston’s endlessly watchable presence. Trumbo flip-flops in quality, being way too conventional and tone-shifting for its own good, but it’s saved by a truly fantastic performance by Bryan Cranston who elevates the material through his electrifying portrayal of Dalton Trumbo.